At the center of an expanding mystery: a fabled Viking runestone left behind in the Minnesota woodland of ages past. In this much anticipated second installment of Neve Maslakovic’s time travel series, St. Sunniva University’s Julia Olsen and Nate Kirkland find themselves hot on the trail of a fourteenth-century artifact, a missing runic specialist, and an all-too-familiar kidnapper who has used the time travel lab’s STEWie (SpaceTimE Warper) for a joyride deep into America’s past. Armed with nothing more than a hunch and a keen understanding of History’s rules, can Julia, Nate, and their teammates track down the kidnapper and the missing researcher before the inevitable — and perilous — clash with History? 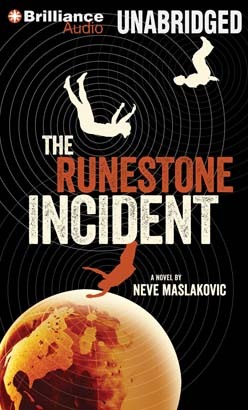 A skillful blend of mystery, science, and history, The Runestone Incident is a smart and satisfying follow-up to The Far Time Incident.